Being responsible for the environment is no longer a choice, but a necessity. The oceans are drowning in plastic, and the view from above seems more like the aftermath of a fraternity pool party then a sustainable eco system. There are many environmental pitfalls when running any drinks company, and some of the things to consider for more mindful production are: the amount of energy used to operate, water usage, product transport and materials used in packaging, among many others. A number of companies are starting to take responsibility by chasing their production methods, using transport analytics, recycled packaging, green energy, and equipment recycling. The following liquor companies are making a phenomenal effort to ensure that not only are their products tasty, but their green footprint is well and truly stamped on changing the current environment for the better. They rightly believe that sustainability is good business practice. The largest privately owned spirits company started tracking their carbon footprint in 2006, and since then have reduced energy usage by 30%, and water by 54%. Some of their projects have included using wind power, turning old barrels into landscaping mulch, and converting leftover botanicals into fertilizer and livestock bedding. Each member of staff is also encouraged to take this ethos home by monitoring electricity usage, participate in car pooling, and ensuring transport is fuel efficient. Since 2014, they have implemented the Good Spirited: Building a Sustainable Future initiative for mindful sourcing, packaging and efficiency and have created the internal Good Spirited Awards. Among this year’s winners were awards for an overhaul of their Cataño rum facility in Puerto Rico to reduce water and energy waste, the zero waste-to-landfill status of Tequila Cazadores, 16 percent water reduction for John Dewars & Sons distilleries (Aberfeldy, Aultmore, Craigellachie, Macduff, Royal Brackla) and reducing the glass weight of bottles for the China Martini brands. 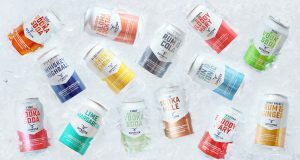 Cutwater Spirits is a young, vibrant spirits company with exceptional spirits (Fugu Vodka recently won double gold in the 2018 NY International Spirits Competition) as well as some of the most spectacular canned cocktails on the market. Using natural flavors and blending them with their quality spirits like Fugu and Old Grove gin, the drinks are outstanding, while being environmentally conscious. Cans are the trendiest thing on the wine scene since rosé’ bloomed into popularity. Why are these cans so prevalent and how do they help with sustainability? Apart from being easier to chill, cans are simpler to stack, pack, and transport. They are lighter than glass, compact to recycle, resulting in a smaller carbon footprint. Based in Seattle, Westland Distillery produces award winning Single Malt whiskies (such as 2018 NYISC double gold for their Peated variant), in a place full of exceptional character. They help the environment by using the natural resources surrounding them, like felled Oregon oak to barrel their whiskey (Garryana), or using local peat bogs to dry the barley for their distillate. The company also helps conserve one of the only unfiltered water systems near a city in the US, with Westland staff going as far as planting trees in the area protecting the land and its water source, ensuring it will exist for future generations to come. Says C&K founder Joe Heron, “Alcohol is an agricultural product. Agriculture is dependent on environmental sustainability – with water supply and pollinator health being the two biggest (but certainly not only) issues." They manage a lot to do their part, including using solar energy for power, distilling with two separate closed loop water recycling mechanisms (one for the gas and one for the chilled water for the condensers), using repurposed shipping containers for event and retail amenities, and using recycled wood for furniture. Visitors who ride a bike to the distillery even get 50% off a tour. Most impressively, they began the “Let the Mystery Be” project. Made from bottle leftovers and the dregs of cocktails, the liquid used for it came from what was dumped into a single container, then re-distilled (killing any possible human germs). It is now aging in barrel, and Heron is excited at how good the spirit is already tasting! Chase is a family owned company that is also the first single-estate distillery in Britain, growing their own potatoes on their estate in Herefordshire as the base for their spirits. This potato-based spirit is even redistilled along with local, wild botanicals to make gin. They have a goal to become fully carbon neutral and self-sufficient by 2020. One of the ways they achieve this is by implementing "Huxley," a biomass boiler fueled by spent wood chips from around the property. In addition, to reduce water usage, much like Copper & Kings, they recycle all cooling water from the condensers for its fermentations. Diageo is a powerhouse of well loved brands like Smirnoff, Bailey’s, Johnnie Walker, and many single malt whiskies such as Lagavulin, Talisker and Oban. When considering a big company with this many alcohol brands, is there any need to take care of the environment they dominate? The answer is, of course, yes, and they do this with the goal of maintaining consumer trust and respect for their products. It's simply smart business sense to invest in protecting natural resources today, like water, to benefit their financial stability in the future. In 2020, they aim for reports on all brands to include: the use of water, eco-friendly packaging, carbon emissions reduction and waste reduction. The idea is to protect their future assets by preserving a sustainable philosophy.